Here's this year's mantle display. I haven't done a done a display in the front hall entrance for a few years now, I miss doing them. 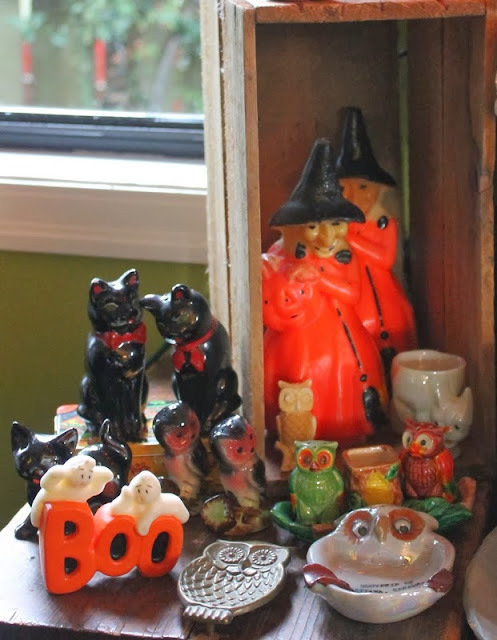 Thanksgiving in Canada is mid October and I like to put up the Thanksgiving collectables so that gives me a very short time for creating a Hallowe'en display. This is the entire display. We have a grandchild and sometimes other kids come by so I like to have the display so that I can keep an eye on it but also show them when they are interested. I didn't put up any of the paper items this year. I decided to put out some items that haven't been out for a while. This is a portion of the collection, most of it was bought about 10 years ago, there was much more vintage around back then. Here is the mantle; close-ups of the items are below. Unfortunately, the two black cats beside the Jack-O-Lantern don't show up very well. This large Jack-O-Lantern was a surprise thank-you from Lori Rudolph several years ago. 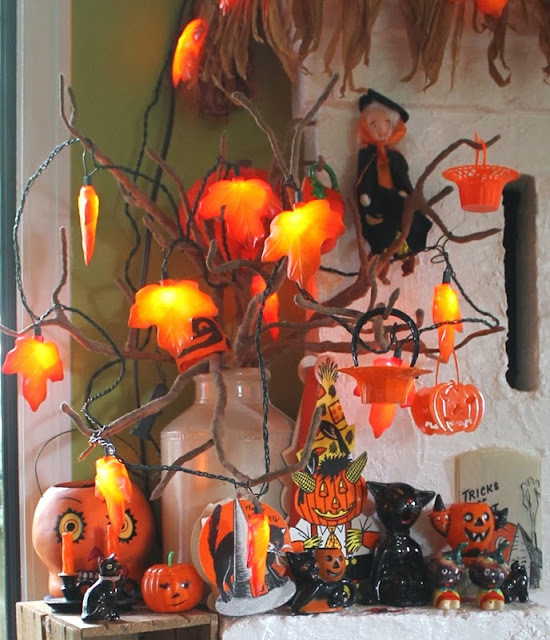 The mould blown plastic pumpkin is a light shade; the inside has a clip to go over a light bulb. I have another one that is twice as big but this one is my favourite. I looked for a wooden lamp base for several years and finally found one; it goes perfectly with the soft brown orange of the lantern. I am quite cavalier when it comes to adding items into collections; the three birds are parts of salt and pepper sets but work perfectly in the colour scheme and the overall look. My wife asked me, "Why are toucans considered Hallowe'en?" and I realized that in some of the vintage graphics there are birds that look similar to these birds. I also like them a lot! The two comic black cats are salt and pepper shakers that I found one year, not at Hallowe'en, with other kitchen items at a thrift store. I love them! The ceramic tree stump in the background is a vase. 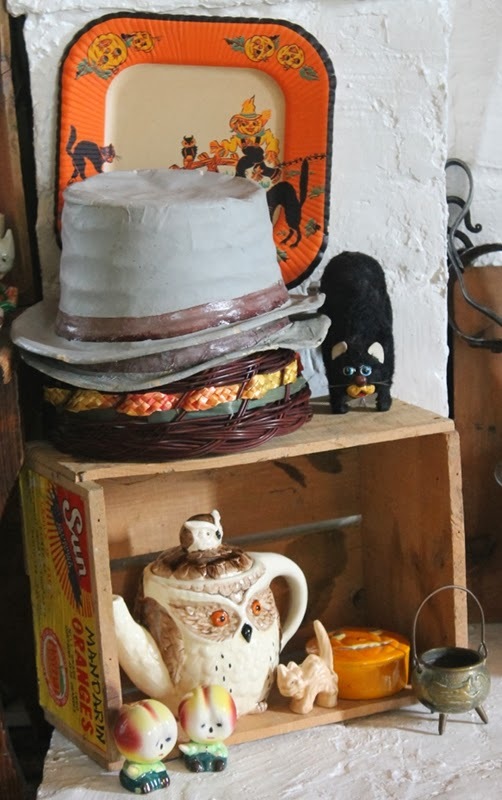 The witch candy container and a few other items were on display at a Sally Ann shop many years ago and were not for sale. I traded them for a large pumpkin I had made. I lucked out on that one; they wouldn't do that today. The black cat in front of her is plaster filled celluloid. The owl is an interesting item; it isn't really a Hallowe'en figure but an early tape measure. The head, feet, and wings are metal and the body is an early plastic of some sort, it's a favourite piece. A favourite piece, right, there quite a few "favourite pieces" here! Tucked in among the vintage items are a set of four soft plastic wind-up walking figures that are about 8 years old. They are quite delightful and are some of the best designed commercial items, in Canada, that I have seen in quite a while. A very large owl cooky jar has a vase of a black cat standing in front of a wooden barrel; not exactly Hallowe'en but it works for me. The ceramic pumpkin florist vase has a light that flashes on and off. The 3 small black items in front of the vase are a cat standing beside a vase on top of a book, each one is different. Trying to photograph them is a little difficult, sorry about that. 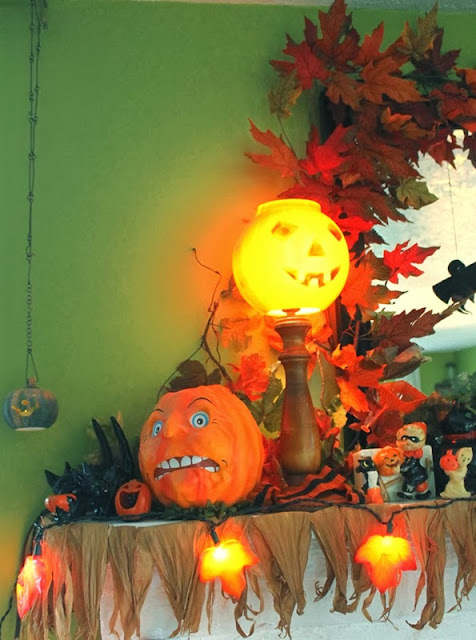 The large pumpkin in the back was from Starbucks several years ago. 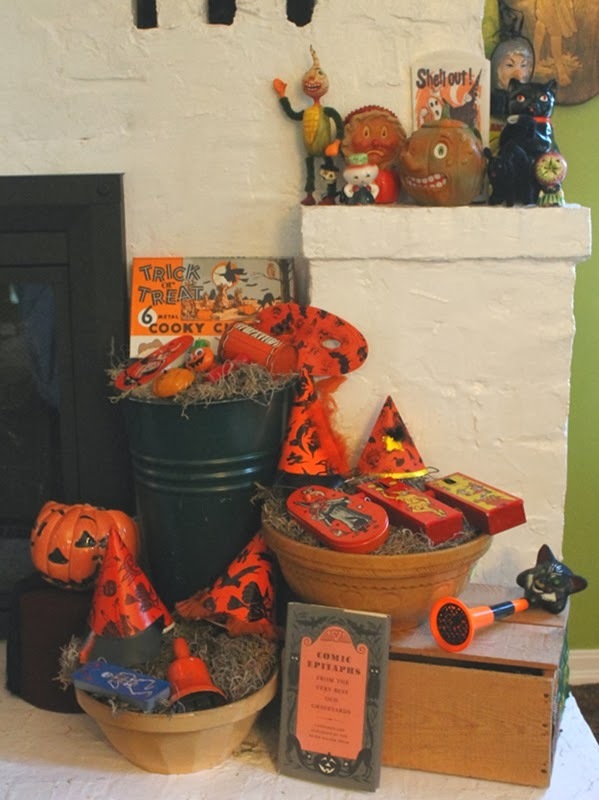 The large black cat beside the pumpkin chocolate box is an incense burner or smoker. Either incense or a lit cigarette would be placed in the back opening and the smoke would come out of his mouth. Fortunately it wasn't used so the painting is in good condition. Candles, owls in various guises; salt and pepper shakers, a small sculpture, and ash trays, alongside cats both black and white, create this vignette. Those two grey top hats were bought at Kresge's when my brother and I were considerably younger. The black cat is a wind-up toy. 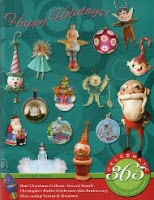 I include figural salt and pepper shakers because they are veggie guys, some are more Hallowe'en than others. This pair is not very Hallowe'eny though is it? In the right side of the display I used two yellow ware bowls that I picked up at Sally Ann about two years ago. I have several vintage wooden Japanese orange crates that I use for risers. Jorge de Rojas of "HoHoHalloween" made the veggie guy, Amelia Schaefer of "Sweet B Folk Art" made the pumpkin pie and Lori Rudolph of "Retro Rudolph's" made the pumpkin teapot. A celluloid witch lantern is peeking around the corner. Noise makers and party hats look intriguing resting on the Spanish moss. The ceramic pumpkin rests on top of a vintage fez. For some unknown reason a fez seems to fit in with Hallowe'en, I do not know why. Here are five other links here, here, here, here, and here to previous Hallowe'en posts.